Cactus Flower Featured in InStyleWeddings.com! Check out InStyleWeddings.com this month, and you'll find some photography of cutting-edge, fall-inspired boutonnieres from yours truly! Click here to see the slideshow. For other beautiful fall wedding flowers by The Studio at Cactus Flower, click here. 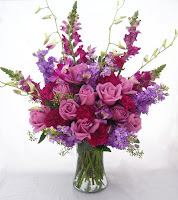 Nominate the Best Grandparent and They Could Win FREE Flowers! So, think your grandparent (or child's grandparent) is the best one in the universe? Or do you know a grandparent that does a great job? Tell us why and they could win a beautiful arrangement in honor of Grandparents Day this Sunday, September 13! P.S. The nominee does not need to live in the Phoenix metro area to win. No purchase necessary. Cactus Flower Partners with Universal Pictures! So have you seen the movie trailer for "Love Happens", starring Jennifer Aniston and Aaron Eckhart? It's a new romantic drama about letting go of the past in order to embrace the possibility that love "happens" when you least expect it. And guess what Aniston's character does for a living? She's a florist! That's why Cactus Flower was asked to partner with Universal Pictures to promote the pre-screening of "Love Happens" here in Scottsdale! We're offering a chance to win 2 reserved seats to the pre-screening on 9/15, as well as the Cactus Flower "Love Happens" arrangement valued at $115. All you have to do is answer one simple question: What does LOVE mean to you? Submit your answer here for a chance to win! If you don't win, you can pick up tickets to the pre-screening on September 11 at our Scottsdale Rd & Mercer Ln location and enter to win a year of flowers!